MEyow! Click here to play! Join this pack of kitties as they roam the back streets of China in a search of a good time. If you can keep up with their wild ways, you might just finish the night with a few treats of your own! You'll get the chance to choose which kitty you want to stick close to. There are five of them including, The King, Lucky Cat, Bat Cat, Kung Fu Kitty and Catzilla. Each offers a different pay table, so have a look through each one to pick which one suits your style. 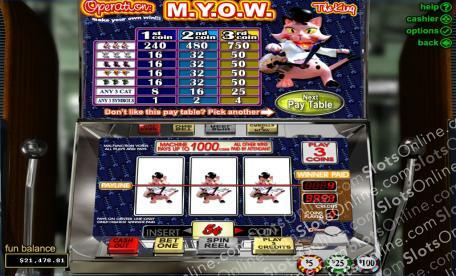 You'll want to spin three of any of the cats across the pay line in order to get the top payout. You can also spin other symbols to help you in a quest for treats such as dragons, red dots, coy fish, lotus flowers and Chinese symbols. All of these will pay out a certain amount of coins, depending on which paytable you choose. But don't worry, they are all pretty generous! So whether you like the tunes of the King kitty, the moves of Kung Fu Kitty, the good fortune of Lucky Cat, the mystery or Bat Cat or the intimidation of Catzilla, join in on the fun that this pack of kitties has to offer!